Temperature – After a cool April, growing degree days have caught up to the 10-year average and surpassed the average in most areas towards the latter part of May. That trend has continued with this recent hot weather in many areas. Rainfall – After a wet April and a variable May, June has been dry. At just over halfway through the month of June, all regions across the province have accumulated below the average for this time. Many regions have accumulated less than 10mm of rain so far in June. Brassica Crops – Tarnished plant bugs are active. Flea beetles are in high numbers in some areas and will be more active at higher temperatures. Continue to scout for diamondback moth, cabbageworm, aphids and thrips. 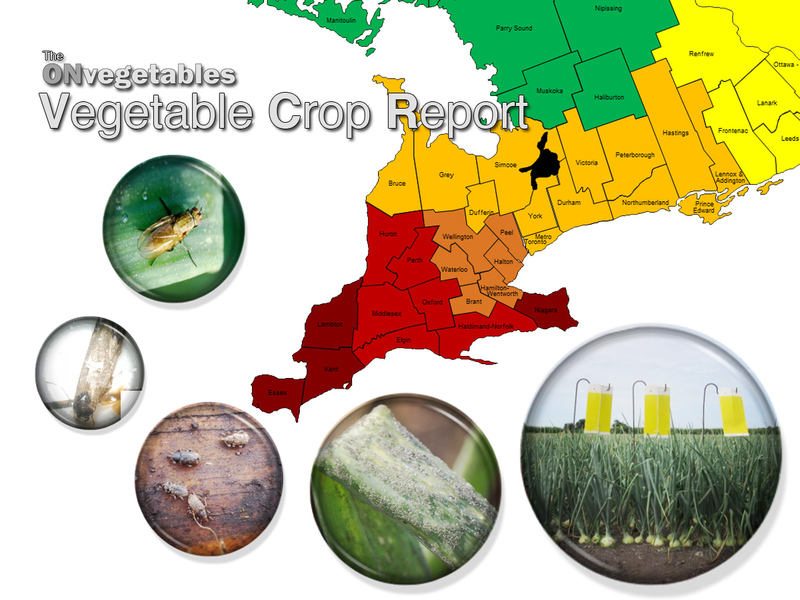 The first generation of cabbage maggot has emerged in most areas of Southwestern Ontario. Carrots – Carrot weevil activity is winding down but the risk is still high in some fields. Carrot rust fly has reached the degree day threshold for emergence in the SW part of the province. Aster leafhoppers have been observed on sticky traps but numbers are low in most fields. Celery – Scout for tarnished plant bugs as they are emerging and are typical found first around field borders. Garlic – Many areas have seen scape emergence in the last week. Scout for slim, light-green 6-14mm leek moth larvae and look for damage on the newest leaves. Yellowing of foliage and tip dieback of older leaves is likely due to stress from herbicide damage, nutrient deficiency or dry conditions. Use a shovel to dig wilted plants and look for seedcorn maggot larvae, wireworms or rot in the basal plate. Rot in the basal plate may be due to bulb and stem nematode, white rot or Fusarium coming in as a secondary pathogen. Healthy roots should be white with very little brown to dark brown. Onion – Earliest direct seeded onions are at the forth leaf stage while the majority of fields are in the 2nd leaf stage. Onion maggot flies are present and low levels of thrips are being seen in transplant fields where there are 5-6 true leaves. Thrips are usually first detected along field borders. Pull the leaves apart and look down into the leaf base for 2mm-long grey adults or very small yellow nymphs ~1mm in length. Onion fields next to hay or overwintering rye are at a greater risk as thrips move once the hay or rye is cut. The spray threshold for onion thrips is one thrips per leaf of plant from an average of 50 plants. Potatoes – Late blight has been confirmed on tomatoes in New York State this past week. Even with this stretch of hot and dry weather, growers should be diligent in scouting for any signs of the disease. Remove any cull piles or volunteers on your farm. Many growers have been busy irrigating during this stretch of warm weather and lack of rainfall. Fields are flowering in the South Western regions of the Province and the crop is starting to size up nicely. For reference on the various thresholds, see table at the very bottom of this post. Use these thresholds as a guide, always confirm insect activity with actual field scouting and trap counts.